Ring News 24Boxing News Breaking Boxing NewsCould we possibly see Vitali Klitschko vs. Anthony Joshua in 2018? Could we possibly see Vitali Klitschko vs. Anthony Joshua in 2018? The night of April 29, 2017 will forever go down as a special and monumental evening in the life of IBF/WBA heavyweight champion Anthony Joshua. Inside of the Wembley Stadium in London, England, Joshua waged a memorable war with living legend and the division’s long-reigning former champion Wladimir Klitschko. In front of crowd of 90,000 in attendance, Joshua won by TKO in the eleventh round after some wild and crazy moments. Joshua dropped Klitschko to the canvas in the fifth round with a barrage of punches, only to be knocked down himself a round later. Joshua would rally to halt Klitschko in the eleventh round, scoring two more knockdowns in a monumental fight. Making the victory even more concrete and historic is the fact that Klitschko would end up announcing his retirement a few months later, as he was one of many prizefighters to retire in 2017. But does that mean we will never see Joshua in the same ring as a Klitschko. That’s not for certain, as Wladimir’s older brother and former heavyweight champion Vitali has expressed interest in avenging that defeat. Throughout his 47-bout career, Vitali compiled a 45-2 record with 41 knockouts while undoubtedly stamping himself as one of the most prolific champions the division has even seen. And while the 6’7” Vitali definitely has the size, power, skills, and experience to compete with the 6’6” Joshua, the lingering questions are in regard to his age (46 years old) and inactivity, as Vitali has yet to fight since his September 2012 TKO victory over Manuel Charr. Turns out that Vitali feels a slight blame in regards to Wladimir’s defeat, as he told his younger brother not to do as much in the sixth round of the bout. In that round, Wladimir had knocked Joshua down and appeared to have him in a bit of trouble. What’s also very interesting to note is how Vitali pays his respect towards Joshua. On one hand, he does admit that the 28-year old champion is the man to beat in the division, the best in his sport, yet he also seems to feel that Wladimir should have won their match. It remains to be seen if Vitali Klitschko will return to professional boxing in 2018. Surely Joshua’s promoter Eddie Hearn will entertain such a thought, and a few tune-up fights from Vitali could get him right back in the mix. One thing is for sure, the passion will always be there for Vitali. “I miss boxing very much. Boxing will always stay in my heart my whole life. 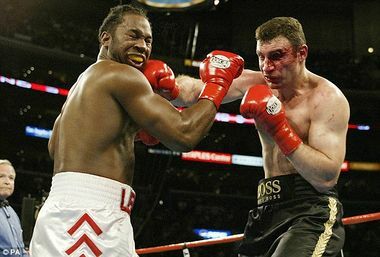 Boxing gave me chances, boxing gave me push in my life,” said Vitali.